Please note: this information dates back to 2005, when Montenegro was not yet an individual political entity. 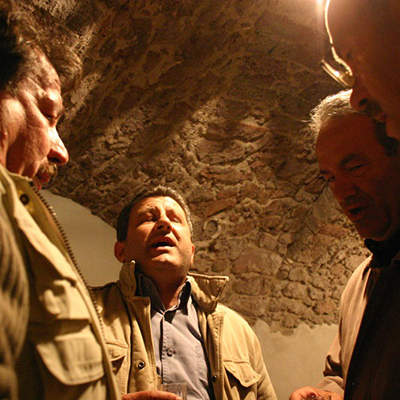 Two styles exist within two-part singing in Serbia and Montenegro: ancient and recent. Ancient two part singing is not tempered, it is based on infra-pentatonic structures, shaped as specific melodies most frequently known as “glasovi” (“voices”) and used as “musical models” of a kind, for creating new songs. Apart from the unison, the most frequent interval (which makes this type of singing really two-part) is the second and that is mostly the one formed between the final and hypofinal. While such singing prevails in Šumadija and a part of western Serbia, also southeast of Serbia (as well as in Montenegro), the type of singing richer in various intervals of the second is characteristic of the larger part of western Serbia, especially the neighborhood of Užice and areas by the river Drina: Jadar, Rađevina, Azbukovica. The second is understood as consonance in the ancient type of the two-part singing, although it refers mostly to the interval between the final and hypofinal. This is not strange, if we know that these tones are the most stable in the tonal system underlying folk songs, while other tones - the first, second, third above the final are more or less unstable and so are the intervals between them. As far as the “polyphonic form” of these songs - it appears as heterophony, more seldom as heterophony-bourdon, the bourdon proper being the last frequent. Heterophony-Bourdon (Ex. 4, northwestern Serbia) is spread mostly in western Serbia, and to some extent in eastern Serbia, while Šumadija, for example, it is practically non-existent. In Serbian two-part singing there are two types of bourdon: 1. continual (Ex. 5, northwestern Serbia), and 2. rhythmic (Ex. 6, southeastern Serbia), while in some songs it is possible to combine the two. 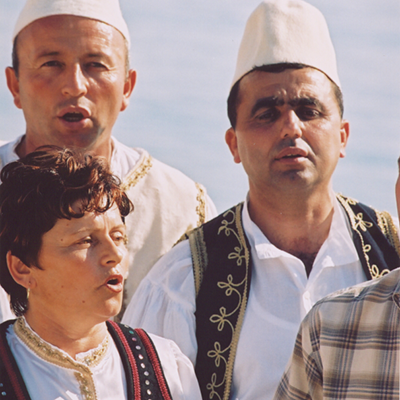 The continual bourdon is characteristic of male singers in western Serbia, an can also be found in Šumadija, performed by women. In eastern Serbia, bourdon is generally rhythmic, which means that the accompanying voice “pronounces” simultaneously with the leading one, or combined, made up of continual and rhythmic bourdon. Recent two part singing came from Croatia. A relatively recent phenomenon there, it appeared in Serbia at various times, depending on the region - between the beginning of World War I and the end of World War II. As two-part singing, it has “taken root” in the areas in which two-part singing had already been developed, probably because something like “harmonic hearing” had previously existed there (western Serbia, Šumadija). 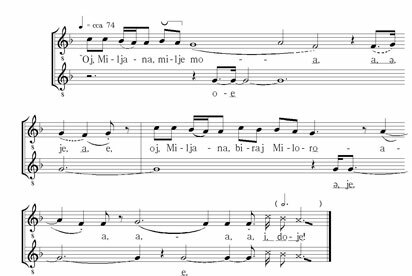 In the areas characterized by one-part singing (north-western Serbia), which means that the feeling for melody, rather than harmony had been developed, the newly introduced homophonic singing was received in a different way. Instead of the usual examples of that type of singing, with features we have discussed above, this latter type is characterized by completely different traits. As the most important one we should point out the inconsistency of the motion in parallel thirds - the intervals of fourths and fifths occur frequently in combination with thirds, or even in parallel motion, reminding us irresistibly of the primeval form of multivoiced singing - the parallel organum. 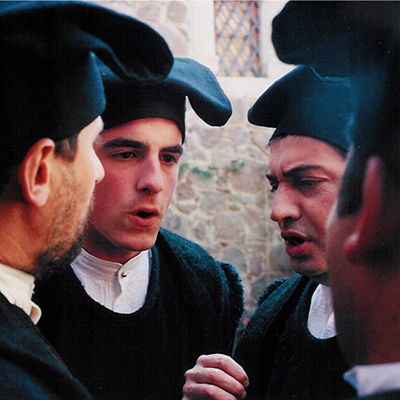 With respect to its origin, recent two part singing obviously based on the western European music tradition is intonationally much “purer”, i.e. closer to the equal temperament than the type of ancient two-part singing, with the qualification that in the vocal practice of some regions into which it was introduced only recently, the intonation is almost the same as in the songs of the ancient musical layer. Tonal structures are also infra-pentatonic and they are shaped into specific melodies, generally called arije (airs), used in a manner similar to the mentioned “glasovi” (in ancient two-part singing). As for the “types of multivoiced singing”, recent singing belongs to homophony, although occasionally it contains some elements of bourdon. Homophony in recent two-part singing is usually conceived as singing in parallel thirds, but in reality this is not so. The chief reason for that lies in the fact that the leading melody is ornamented and accordingly, more developed than the accompanying one; the thirds do not occur isolated but as part of a richer melodic-harmonic milieu, created as the consequence of specific nonharmonic notes: passing notes, alternating notes, anticipations (Ex. 7, southwestern Serbia). The deviation from the consistent motion in parallel thirds caused by the movement of the accompanying voice - the G if voice is accompanied not by E but by C, producing the characteristic interval of the perfect fifth - most often at the ends of melo-poetic units. Compiled by Dimitrije Golemović and Selena Rakočević: 2005. Dević, Dragoslav. 1986. Narodna muzika Dragačeva (Oblici i razvoj). [Folk Music in Dragačevo (Forms and Development). A gramophone record included]. FMU Beograd. Jovanović, Jelena (Gligorijević) and Radmila Petrović. 2003. `Ej, Rudniče, ti planino stara – Tradicionalno pevanje i sviranje grupe “Crnućanka” [Hey, Rudnik, you old Mountain – Traditional Singing and Playing by the “Crnućanka” Group]. Muzikološki institut SANU, Kulturni centar Gornji Milanovac i Vukova zadužbina. Belgrade. Dević, Dragoslav. 1972. Razvrstavanje višeglasnih oblika (Prilog problemu klasifikacije). [A Classification of Polyphonic Forms (A Contribution to Classification Issue]. Rad XVII kongresa SUFJ (Poreč, 1970). Zagreb, SUFJ i DFH, 319-322. Dević, Dragoslav. 1984. Serbia. 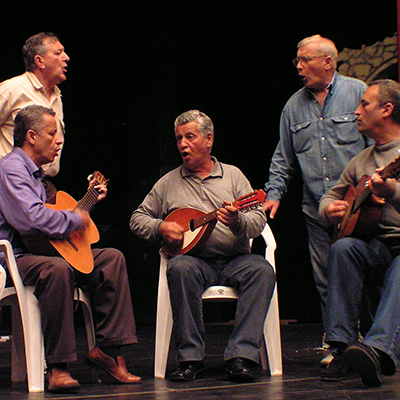 Folk Music – Srbija. Narodna muzika. In Leksikon jugoslavenske muzike, tom 2 (Me – Ž), Zagreb, Jugoslavenski leksikografski zavod "Miroslav Krleža", 342-353. Dević, Dragoslav. 1992. Narodna muzika. [Folk Music]. In: Kulturna istorija Svrljiga, knj. II, Narodni Univerzitet, Prosveta, Svrljig, Niš. 427-539. Dević, Dragoslav. 1995. Arhaično dvoglasno pevanje bordunskog tipa u centralnobalkanskom prostoru i njegovi mogući koreni . [The Archaic Two-Part Singing of the Bourdon Type in the Region of Central Balkans and its Possible Roots]. In: Etno-kulturološki zbornik, knj. I, Etno-kulturološka radionica, Svrljig. 41-50. Dević, Dragoslav. 1997. 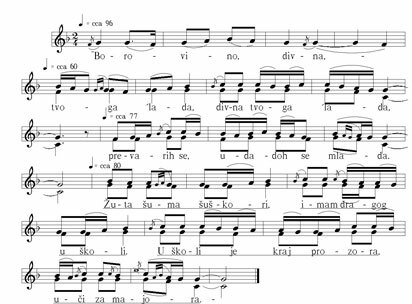 Hybrid Forms of Polyphonic Singing in Serbia. In: Conference collection. IV International Symposium Folklore – Music – Work of Art (Belgrade, 1995). Faculty of Music. Belgrade. 126-144. Dević, Dragoslav. 2001. Istorijski aspekt arhaičnog folklornog višeglasja balkanskog kulturnog prostora. [The Historical Aspect of Archaic Demotic Multivoiced Singing on the Balkan Cultural Space]. In: Conference collection. II međunarodni simpozij. Muzika u društvu. Muzikološko društvo FBiH i Muzička akademija. Sarajevo. 122-139. Golemović, Dimitrije O. 1979. “Stariji oblici pevanja u Takovskom predelu”. 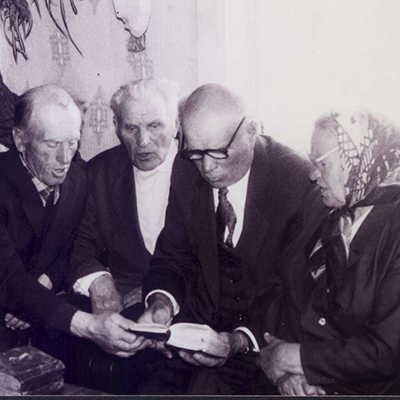 [Older forms of singing in the Takovo region]. In: Razvitak, br. 6. Novinsko-izdavacka organizacija OOUR “Timok”, Zaječar. 89-91. Golemović, Dimitrije O. 1980. “Pevanje na bas kao odraz narodnog ukusa”. [Singing na bas as a reflection of folk taste]. In: Razvitak, br. 4-5, Novinsko-izdavacka organizacija OOUR “Timok”, Zaječar. 110-112. Golemović, Dimitrije O. 1983. “Pevačice iz Ribaševine”, [Women Singers from Ribaševina]. In: Narodno stvaralastvo – Folklor, 2-4, SUFJ, Beograd. 33-45. Golemović, Dimitrije O. 1983. “Novije dvoglasno pevanje u Srbiji”. [Newer rural two-part singing in Serbia]. In: Glasnik etnografskog muzeja, br. 47. Beograd. 117-156. Golemović, Dimitrije O. 1984. “Novije seosko dvoglasno pevanje u NOR-u”. [Newer rural two-part singing in World War II]. In: Conference collection. Ljudska glasba v NOB in revoluciji. XXII FESTIVAL KURIRČEK, Maribor. 86-90. Golemović, Dimitrije O. 1985. “Svatovsko pevanje u Bačkom Monoštoru”. [Singing at weddings in Bački Monoštor]. In: Conference collection. 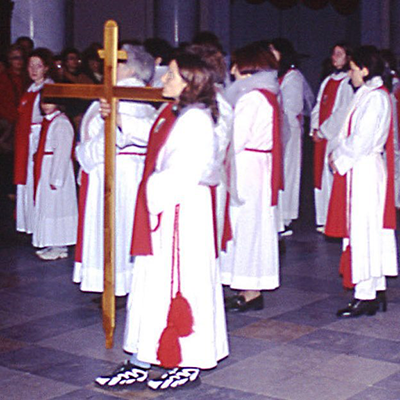 XXXII kongres SUFJ, Sombor 1985, Udruženje folklorista SAP Vojvodine, Novi Sad. 47-59. Golemović, Dimitrije O. 1989. “Narodno pevanje Tamnave”. [Folk singing in the Tamnava region]. In: Zbornik Matice srpske za scenske umetnosti i muziku, 4-5, Matica Srpska, Novi Sad. 93-106. Golemović, Dimitrije O. 1989. „Muzička tradicija Azbukovice“. [Musical tradition of the Azbukovica region]. In: Muzička tradicija i narodne igre Azbukovice, SIZ kulture i fizičke kulture opstine Ljubovija, Ljubovija. 8-196. Golemović, Dimitrije O. 1990. „Narodna muzika Valjevske Kolubare“. [Folk music of the Valjevska Kolubara Region]. Istraživanja, VI (Valjevska Kolubara), Narodni muzej. Valjevo. 389-430. Golemović, Dimitrije O. 1990. Narodna muzika užičkog kraja. [Folk Music of the Užice Region], SANU, Etnografski institut, Posebna izdanja, knjiga 30, sveska 2, Beograd . Golemović, Dimitrije O. 1991. „Uloga pratećeg glasa u srpskom narodnom dvoglasnom pevanju“. [The role of the accompanying voice in Serbian traditional two-part singing]. In: Narodna umjetnost, Posebno izdanje 3, Zavod za istraživanje folklora, Zagreb. 309-315. Golemović, Dimitrije O. 1994. „Muzička tradicija Takova“. [Musical tradition of the Takovo region]. Takovo u igri i pesmi, Tipoplastika, Gornji Milanovac, 83-197. Golemović, Dimitrije O. 1997. „Jednoglas u našem narodnom pevanju kao jedan od vidova razvoja dvoglasa“. [Monophony in our folk singing as an aspect of the transformation of diaphony]. In: Conference collection. IV International Symposium, Folklore – Music – Work of Art, Belgrade 1995, Faculty of Music, Belgrade. 265-277. Golemović, Dimitrije O.. 1996. „Srpsko dvoglasno pevanje (oblici-poreklo-razvoj)“. 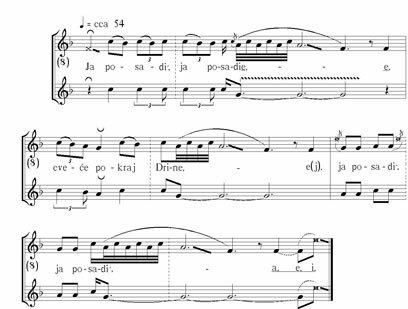 [Serbian two-part singing (forms – origin – development). Part I] . In: New Sound, 8. Union of Yugoslav Composers' Organizations, Belgrade, 11-22. Golemović, Dimitrije O.. 1997. „Srpsko dvoglasno pevanje (oblici-poreklo-razvoj)“. [Serbian two-part singing (forms – origin – developmen). Part II]. In: New Sound, 9. Union of Yugoslav Composers' Organizations,. Belgrade. 21-37. Golemović, Dimitrije O. 2001. „Cikobas i foburdon“. [Cikobas and faux-bourdon]. In: Conference collection. Vlado Milošević, etnomuzikolog i kompozitor, Banja Luka. 67-81. Jovanović, Jelena (Gligorijević). 2002. Starinske svadbene pesme i običaji u Gornjoj Jasenici – svatovski glas i njegovi oblici [Traditional Wedding Songs and Customs in Upper Jasenica]. Muzikološki institut SANU. Beograd. Jovanović, Jelena (Gligorijević). 1988. Vokalna muzička tradicija u oplenačkom kraju. [Vocal Music Tradition in Oplenac Area]. In: Sabor narodnog stvaralaštva Srbije 1, IV. Topola, 6-8. Jovanović, Jelena (Gligorijević). 1999. Hibridni oblici pesama u Gornjoj Jasenici. [Hybrid forms of songs in Upper Jasenica]. In: 27. Sabor narodnog stvaralaštva Srbije, Topola. 32-35. Rakočević, Selena 2003. Višeglasno pevanje u Donjem Banatu. Aspekti razvoja harmonskog sluha u tradicionalnoj vokalnoj praksi . [Multi-part singing in Lower Banat. Aspects of the development of the sense of harmony in traditional vocal practice]. In: Conference collection. Internacionalni simpozijum posvećen 75. godišnjici života prof. dr Dragoslava Devica. Čovek i muzika. Vedes. Beograd. 37-63. Vukičević-Zakić, Mirjana. Radinović, Sanja. 2003. Vasiljevićeva tabela ležećih tonova. [Vasiljević’s Scheme of Bourdon Sounds]. In: M. A. Vasiljević. Narodne melodije s Kosova i Metohije, Beogradska knjiga. Nota, Beograd. Knjaževac. 398-401. Zlata Marjanović Krstić, Vokalna muzička tradicija Boke Kotorske, (Vocal tradition of Boka Kotorska), Udruženje kompozitora Crne Gore, Podgorica, 1998. Marjanović, Zlata 1990. Novokomponovana narodna pesma u razvojnom procesu (Na primeru dalmatinskog pevanja). [New-composed folk song in development proces (on dalmatian urban folk-song model]. In: Conference collection. XXXVII kongres SUFJ,Zagreb. 214-223. Marjanović, Zlata 2001. Vokalna tradicija Boke Kotorske i Crnogorskog primorja: od pevanja iz glasa do klape. [Vocal tradition of Boka Kotorska and Montenegro seacoast], In: Conference collection. Internacionalni simpozijum posvećen 75. godišnjici života prof. dr Dragoslava Devica. Čovek i muzika. Vedes. Beograd. 7-36.